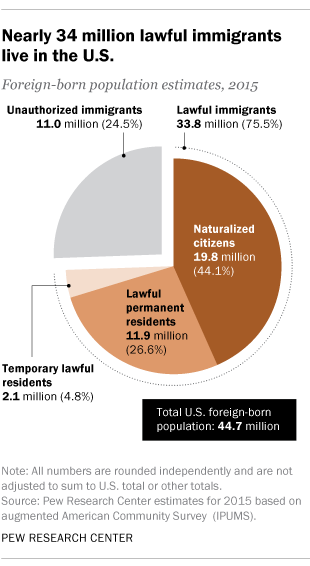 Lawful immigrants account for three-quarters of the foreign-born population in the U.S. – 33.8 million people out of 44.7 million in 2015, the most recent year for which numbers were available. Among lawful immigrants, those who hold U.S. citizenship (19.8 million in 2015) outnumber lawful permanent residents (11.9 million). The rest of the foreign-born population consists of 11 million unauthorized immigrants and 2.1 million people in the U.S. on temporary visas. The total foreign-born population, 13.4% of the U.S. population in 2015, is somewhat below the historic high of 14.8% in 1890, when 9.2 million immigrants lived in the U.S.
President Donald Trump endorsed a Senate bill on Aug. 2 that would reduce the number of foreigners granted lawful permanent resident status each year by half, with the intention of decreasing immigration levels overall. The bill would change decades of policy in deciding who should receive lawful permanent resident status by shifting the emphasis on family ties to the value of job skills that applicants would bring. It would also eliminate the “diversity” category for immigrants from countries with low immigration to the U.S. and decrease refugee admissions. 1One million immigrants receive lawful permanent resident status each year – also known as a green card – that puts them on a path to citizenship, and most are sponsored by family members. 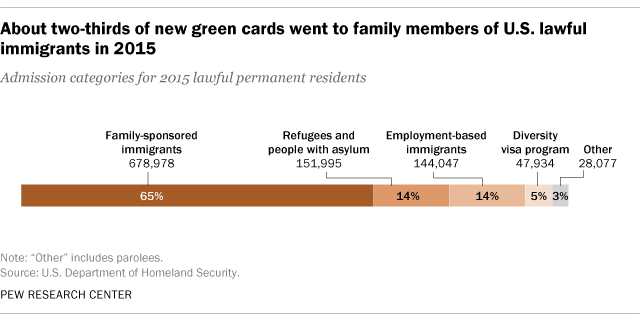 Among the 1,051,031 people granted green cards in fiscal 2015, 65% were relatives of a U.S. citizen or lawful permanent resident. Most of these relatives are spouses (25% of new lawful permanent residents), parents (13%) and minor children (6.3%) of U.S. citizens ages 21 and older; they are admitted without quotas. Other family admission visas – for adult children and siblings of U.S. citizens, and spouses and children of lawful permanent residents – are subject to category and country limits. About 144,000 green cards in fiscal 2015 went to people on employment visas and their family members. About 152,000 went to refugees and people granted asylum. Nearly 48,000 went to immigrants admitted under a “diversity” program to provide additional visas to nations with low U.S. immigration. From fiscal 2004 to 2015, 57% of people who got green cards already lived in the U.S. on temporary visas: There were a total of 5.5 million new arrivals, compared with a total of 7.4 million already living in the U.S. who adjusted their immigration status. Lawful permanent residents are authorized to work in the U.S., travel outside the country and receive some federal benefits. They may apply for U.S. citizenship after meeting length-of-stay requirements, generally five years of continuous U.S. residence. This system largely reflects a broad immigration reform law passed in 1965. 2The most common regions of origin for lawful immigrants differ from those of unauthorized immigrants, according to Pew Research Center estimates. Lawful immigrants are more likely to be from Asia (29% in 2014, compared with 13% of unauthorized immigrants), as well as from Europe and Canada (16% compared with 5%) and the Caribbean (12% vs. 4%). Lawful immigrants are markedly less likely than unauthorized immigrants to be from Mexico (20% vs. 52%), though lawful immigrants from Mexico (6.3 million in 2014) outnumber unauthorized immigrants from that country (5.8 million). 3Lawful immigrants are more concentrated in certain metro areas than the overall population, with New York (4.8 million in 2014) and Los Angeles (3.5 million) having the largest, according to Pew Research Center estimates. Other metro areas with more than a million lawful immigrants in 2014 include Miami (2 million), Chicago (1.3 million), San Francisco (1.2 million) and Washington, D.C. (1 million). Among lawful immigrants, 43% live in these six metros; among the total U.S. population, 19% live in these six metros. Some of these lawful immigrants have temporary visas. 4Lawful immigrants are more likely to be of working age (18 to 64) than people born in the U.S., and they are overrepresented in particular occupations. Three-quarters (76% in 2014) are in this age group, compared with 60% of the U.S. born and 92% of unauthorized immigrants. The 19.5 million lawful immigrants in the labor force made up 12% of U.S. residents who were working or looking for work in 2014, up from 9% in 1995. By job type, they are overrepresented in some occupations and underrepresented in others. Lawful immigrants accounted for 20% of farming, fishing and forestry workers in 2014 – the largest share of the workforce among major occupation groups – but only 9% of office and administrative support workers. Some of these immigrants include those with temporary visas. 5Not all U.S. lawful immigrants eligible to apply for citizenship do so. Two-thirds (67%) of those eligible for citizenship had obtained it by 2015, according to Pew Research Center estimates. The share of those eligible who have naturalized is at its highest level in more than two decades. However, there are sharp differences among country of origin groups: Only 42% of eligible Mexican lawful immigrants had obtained U.S. citizenship by 2015, compared with 83% of those from the Middle East. To become a U.S. citizen, lawful permanent residents must meet length-of-stay requirements (usually five years of continuous residence) as well as other requirements.